ABB (ASEA Brown Boveri) is a Swiss multinational corporation headquartered in Zurich, Switzerland, operating mainly in robotics and the power and automation technology areas. It ranked 158th in the Forbes Ranking(2013). ABB is one of the largest engineering companies as well as one of the largest conglomerates in the world. Renergy Limited has partnered with ABB for several years and we provide inverters for both domestic scale PV systems and large industrial PV systems. 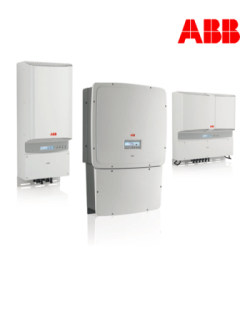 ABB inverters are backed up by a warranty of 5 years which can be extended to 10 years. For more information and specifications on ABB Trio 5.8_7.5_8.5 click here. For more information and specifications on ABB PVI-3.0-3.6-4.2 click here.